The Kermit the frog socks I've been making for Will are finally done. It only took me forever and a day. I call them Kermit socks because when he first saw me knitting the pair previously shown he said, "I want a pair of socks too. A bright green pair." "What, like Kermit the frog?" I asked. "Yeah, like that." They don't look very green but that's because of the horrible light, and the crappy camera on my phone (the only one at hand for the moment), and I know they look kinda big, but they are on my hubbies feet which are a size or two smaller then Wills. 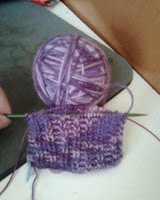 On the needles right now are socks for my sister Maggie, inspired by her love for the Twilight book series. It's the Twilight sock pattern from 2-at-a-time socks. This is actually the fourth time I'm attempting to make these socks. The first time they laddered horribly, the second time I made them on one circular needle at one time and couldn't find instructions on what to do after the leg, the third time I was doing them both on a really long needle, ended up dropping like 10 stitches and really couldn't be bothered to pick them all up when I knew it was just going to get worst if I tried. So here we are...at try number 4. Hopefully this will be the one that actually goes somewhere.